In our most recent League Cup sample, covering February 3-4, VikaBulu took 20.43% of the sample's CP to become the #1 deck in the rankings. 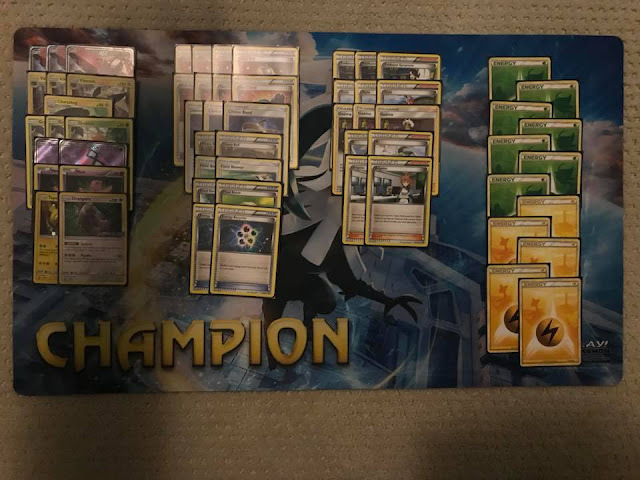 While it won only 2 of the 14 Standard Cups in the sample, it took many 2nd-place and Top 4 finishes, making it appear to be a strong contender as we head towards the end of Quarter 2 and the last weekend of Cups before Ultra Prism is legal. VikaBulu lists from a few weeks ago, modeled after KicaBulu, took a bad matchup to Gardevoir-GX, which at that time was not heavily played. Now, Gardevoir is seeing more play: it was the #3 deck in last weekend's sample, with 13.26% of the total CP. For this reason, many of the newest VikaBulu lists are reverting to the older, techier concepts that are able to beat Gardevoir. Another deck to watch would be Buzzwole-GX/Garbodor. 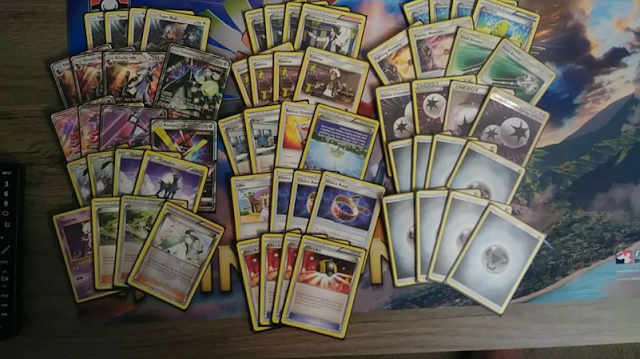 Several good players chose to play it at their Cups and Marc Lutz took 3rd place at Leipzig Regionals with a version that played Carbink BREAK. 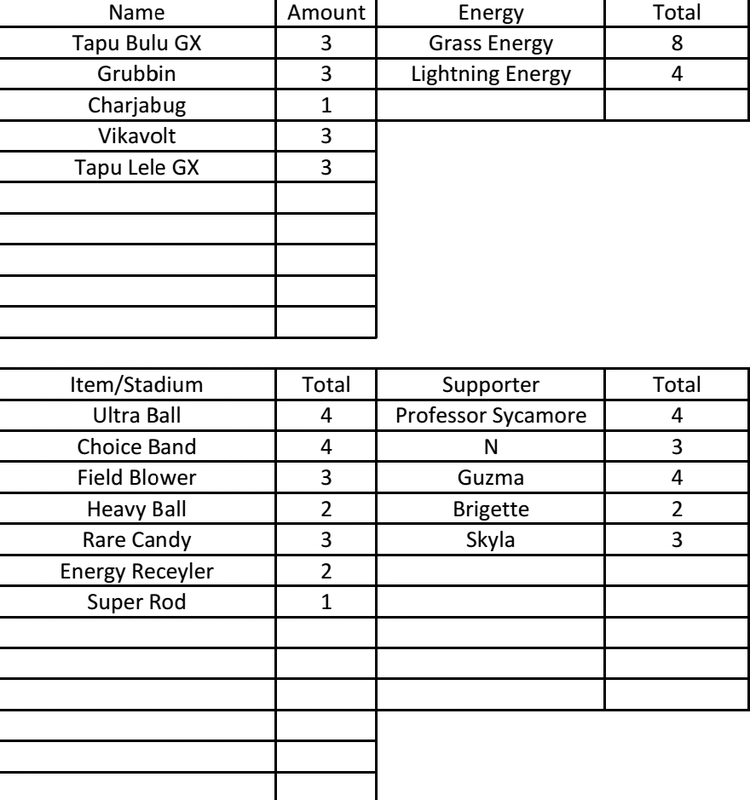 Note the Charjabug and unusual 8-4 Energy split. 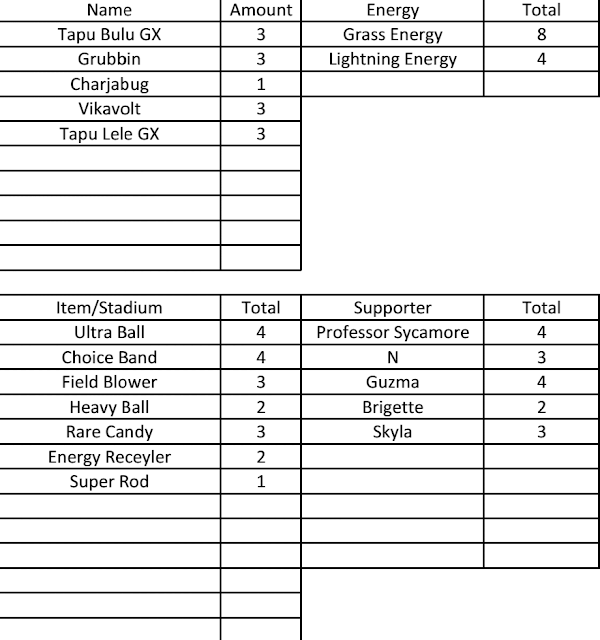 The list also plays Brigette (KicaBulu does not), and the 3 Field Blower should also be a good choice for next weekend as Garbodor decks continue to maintain presence in the format. R1: W Vikabulu 1-0 - Garbotoxin is good. Early pressure with Buzzwole was nice too. Vikabulu's spike in usage at cups is one of the reasons I wanted to play Buzzwole Garb. 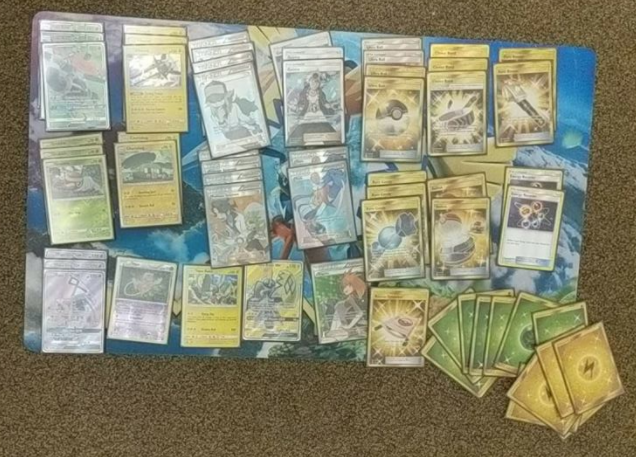 R2: L ZoroPod 0-1 - Laid bricks the whole game, highlight of this game was using Sudowoodo to armor press and get more than 1 turn of usage out of Sudowoodo. 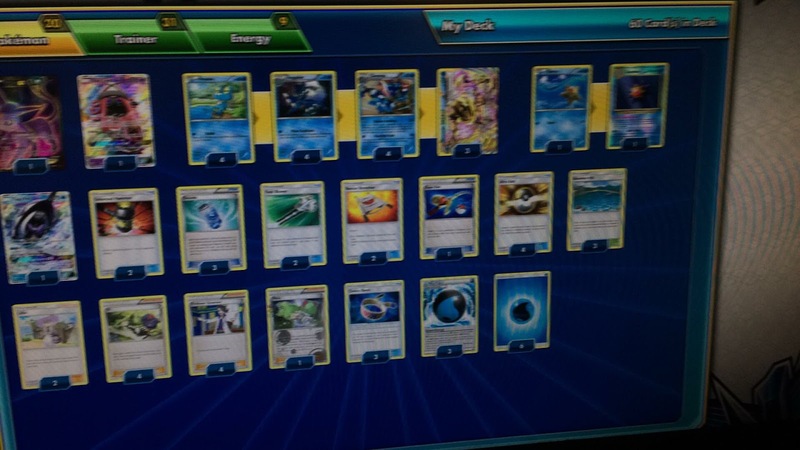 R3: W Greninja Zoroark 1-0 - Garbotoxin once again saves this matchup for me. He only got out one break and not being able to trade for a majority of the game hurt him a lot. R4: L Gardy 0-1 - He got out 2 Gardys turn 2 and I couldn't hit float stones to lock abilities until too late. Was so upset about this one, because Gardy can be an amazing matchup if you don't brick, I almost dropped thinking I was mathematically eliminated, but I decided to play it out because Josh and Nate were doing so well and figured I'd have nothing else to do lol. R5: W Sylveon/Zoroark (Owen Rob) 1-0 - Very interesting deck, being able to lock trade all game was great. Buzzwole and Trashalanche swept through. Enhanced Hammer is great. 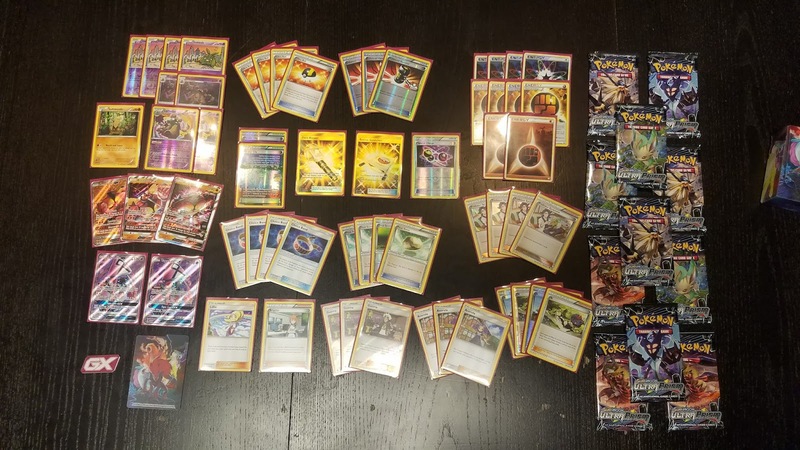 R6: W Honchkrow Tapu Koko Counter Energy Spread (Steve Guthrie Jr.) - Garbotoxin early and Trashalanche late kept Steve from setting up too quickly. Single prize exchanges late game made this game significantly easier. Forced me to think a LOT about when to KO things and letting Steve KO a buzzwole first to slow down his counter energy usage helped me a lot, along with him not drawing so great. Squeaked into Top 8 by a little over 1%!!! T8: W Gardy 2-1 - Austin Ellis has been consistently doing very well at regionals this season and is a very, very good player. I knew I'd have to play well and get kind of lucky to get out of top 8 against him with the win. Trashalanche took the game with a choice band he N'ed me into, because he didn't twilight in game 3 and had exactly 10 items in discard. He got off to kind of a slow start, letting Buzzwole apply pressure early as well. T4: L VikaBulu - Game 1 was a disaster for me. Deck basically imploded. Not much noteworthy here. Game 2 was a lot closer. I got down 6-2, and got the trashalanche Garbotoxin combo out, making life a lot harder for Nathaniel Lamar. Tied the game up at 2-2, and Special charged 2 rainbows back in before sycamoring, needing a choice band and a rainbow to take the win with 2nd trashalanche. Hit the band, didn't hit the energy. Nate advances and goes on to win! I now understand when certain players after they do well at an event say they "Will never play that deck again." Playing this deck when all cylinders are firing, it's amazing and not much can beat it. When it bricks, you just kind of sit there doing nothing, and that's a really really bad feeling. This deck had it's ups and downs and if not for barely squeaking into top 8, I'd have a completely different attitude about the day on an individual level. 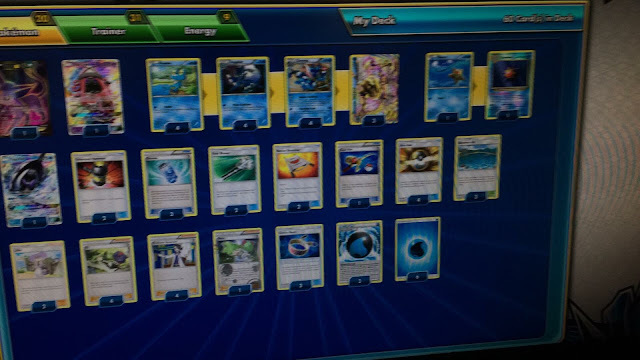 Garbodor decks have now gotten me over half my CP and I'm not sure how I feel about that lol. If you have any questions, don't be afraid to hit me up! "Mewtwo was for Buzzwole (which I never played), Kartana was eh, Cobalion was MVP, and never had to use the Memory cards. I would have liked more metal energy and maybe an Oranguru"